Hi everyone. Came across this picture on another message board and I need to identify it. It seems to be some kind of auto part, but I'm not positive. Does anybody know what this is? We guessed stem mechanism of a globe valve and that came up wrong. But maybe it's a shrader. I'll look into it. Thanks! It has a scale on it and appears to work like a micrometer to measure depth. Thanks for the response! Which end do you think is the scale? The black end, or the narrow end? I'm finding things that look similar but not quite like this using google images on micrometer. Still not sure. But it's a good start! The lines on the inner shaft represent .025" increments and the scale on the turning know would be .001 increments up to .025 and start over every time it reaches and line on the inner shaft. Thanks again. I think you're really onto something here. Are there any other devices that use these types of dials and measurements? Yes, we use micrometers for measuring thickness all the time. 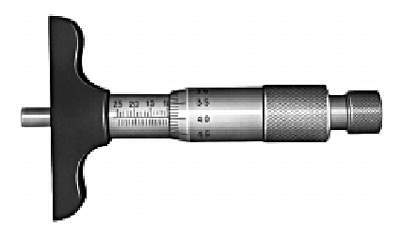 The depth micrometer is used to measure the precise depth of holes, grooves and recesses by using interchangeable rods to accommodate different depth measurements. 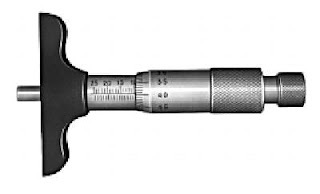 When using a micrometer, you must make sure the base of the micrometer has a flat, smooth surface to rest on and that it is held firmly in place to endure an accurate measurement. Thanks for the help guys. The picture actually ended up being a lockpick for an abus granite lock. The change in quality of the pictures changes the whole appearance of the tool. Tell me about it. It was a complete sham, but we still won because our pictures were even harder to guess.